04 Mart 2019 Pazartesi 19:00 - 7 reads. VISTA! The 28th match day of the Jupiler Pro League belongs to the past, so it's time to cards in a new episode of VISTA!, our voetbalwebcast in collaboration with Proximus Sports. Central guest today was none other than Trond Sollied, the Norwegian who earlier this season is still just getting started was at Lokeren. Under the condemnation of his ex-team 1B was addressed, but also the last straight line towards the play-offs and the thrilling denouement in 1B were discussed. Sollied was joined by Rudy Nuyens, voetbaljournalist with The Latest News and Wim De Coninck, analyst at Proximus Sports. Nicolas De Brabander led everything in the right direction. The curtain came down yesterday for Sporting Lokeren. After 23 uninterrupted seasons in our nation's highest class is degradation bitterharde reality. “Unfortunately,” said Sollied. “You get a bond as a coach with the players, the staff and the people. But it is not a surprise. It took a long time, but it was about to come. 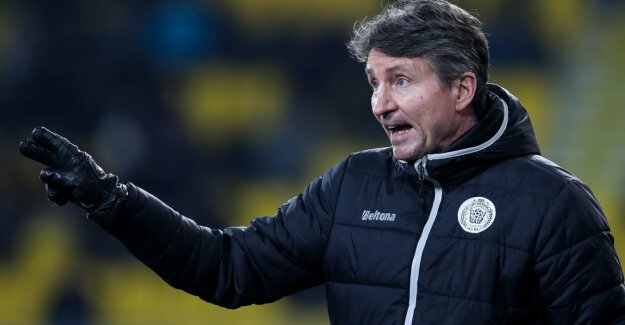 If Waasland-Beveren and Mouscron points continue to tackle, it is that gap bigger and bigger.” Itself looked Sollied not to the 1-2 defeat of his ex-team. “I was at the Batibouw exhibition yesterday” (laughs).